Hong Kong has a well-deserved reputation for superb shopping and there are plenty of hotels that make this activity very convenient. Here are five hotels that offer great shopping, either in the hotel itself, near one of Hong Kong's best shopping malls or on the doorstep of Hong Kong's famous markets. The hotels run from five-star luxury to solid three-star comfort. One of the city’s swankiest hotels inside the city’s swankiest shopping mall, the Landmark Mandarin Oriental takes its name and sits on top of the Landmark Mall. Inside you’ll find superstars and sheiks swaggering around the world’s most exclusive boutiques, from Dior to Diane von Furstenberg. Many of the international brands have their only Hong Kong – and sometimes Asia – shop inside the Landmark. The hotel itself is a slightly more contemporary take on its sibling, the imperious Mandarin Oriental just around the corner. Located in the heart of the Central district, the Landmark Mandarin Oriental boasts a Michelin starred restaurant and one of the city’s most sought after spas. While it’s lost a little of its star power since the arrival of sleeker, slicker rivals with more gadgets and lengthier pillow menu, the Excelsior remains one of the grand old dames of the Hong Kong hotel scene. While the lobby can be a little packed and the service a little slow, the enduring popularity of the Excelsior speaks to both the high quality of its rooms and generous prices it offers. It’s also in a superb location for shoppers on the crest of Causeway Bay, a location that offers an abundance of shops. Malls, markets, fashion streets, departments stores – it’s all here – and as the sun goes down, the neon lights up to create one of ​Hong Kong’s most iconic scenes. Hong Kong Harbour City is Hong Kong’s biggest shopping mall, boasting an incredible 400 + shops, 50 restaurants, and a cruise ferry terminal. It’s also home to three hotels - The Marco Polo, The Gateway and The Prince. All three are run by the same group, with the Marco Polo claiming five stars and the Prince and Gateway four. Set on the Kowloon waterfront in Tsim Sha Tsui, the Marco Polo is probably a little overpriced when measured against its rivals but the Prince and Gateway, in particular, are good value. Expect well-appointed rooms, superb views of ​Victoria Harbour and the city on your doorstep. Few hotels are brave enough to dip their toes outside the well-trodden tourist paths of Tsim Sha Tsui and Central, which is what makes The Langham Place Hotel over in Mongkok such an attractive proposition. Mongkok is one of Hong Kong’s most crowded, smelliest and sweatiest districts. It’s also one of its most authentic. The streets here are crammed with mom and pop stores, street food vendors and, most importantly, some fantastic markets. Few districts have as much energy and enthusiasm as Mongkok and The Langham Place hotel offers a five-star retreat right in the center. 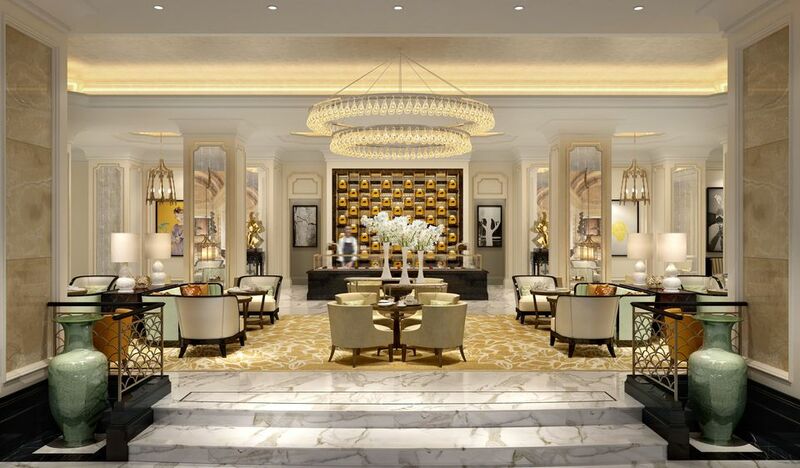 Renowned for its cutting edge technology, including i-Homes and in-house mobile phones, the Langham also features one a two-star Michelin restaurant, an award-winning spa and a gallery collection of art and Chinese antiques. The hotel is also connected to the Langham Place Mall, which is popular with local teenagers. While they might be more famous for churches and cathedrals, the Catholic Diocese of Hong Kong also manages a very reputable hotel. Despite being a modest three-star, the rooms at the Bishop Lei International are well turned out, feature air conditioning, cable TV, and most other internationally expected amenities. The hotel can even boast an outdoor pool. The shopping angle comes from the Bishop Lei International Hotel’s location just around the corner from Hollywood Road. All along this winding road, you’ll find some of the world’s most respected dealers in Chinese antiques and the art galleries that have been breaking records with sales of Chinese contemporary art.